This NEW report, The office furniture market in the Gulf countries provides market trends and updated data on the office furniture production, consumption, import and exports in 6 countries of the Gulf Region. Office furniture sales are broken down by segment (office seating, operative desks, executive furniture, storage, communal areas) and by distribution channels (direct sales, furniture dealers, contractors and architects). Office furniture imports and exports are broken down by country and geographical area of origin/destination. Forecasts 2015 and 2016 of office furniture consumption are available. The report gives figures on sales and estimates on market shares for approximately 100 sector companies operating in the region and also includes short profiles of leading manufacturers (local and international). Market quantification is accompanied by a description of competition and a particular focus on distribution and how international players operate on the market. An analysis of the furniture market includes: Demand Drivers (macroeconomic indicators, population GDP, and details on the potential market in the contract sector). Annex provides addresses of about 100 leading office companies and a list of selected trade press as well as a list of sector fair. The office furniture market in the Gulf Countries is worth about US$ 1,054 million. Manufacturing activities in the region are still limited (Saudi Arabia is an exception) and imported items claim the largest market share. 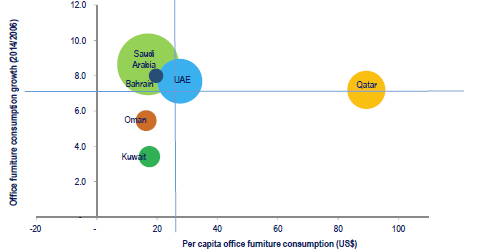 The largest markets in terms of office furniture consumption are Saudi Arabia, UAE and Qatar. According to CSIL estimates, office furniture consumption across the whole region increased on average by 2.3% in 2014 and performances are expected to improve in 2015 and 2016.